President Donald Trump asked former New Jersey Gov. Chris Christie multiple times if he would be willing to be vice president, according to an excerpt from Christie’s upcoming book. Christie lifted the veil on his friendship with Trump in “Let Me Finish: Trump, the Kushners, Bannon, New Jersey, and the Power of In Your Face Politics,” which is out this week. From left, White House senior adviser Jared Kushner, New Jersey Gov. 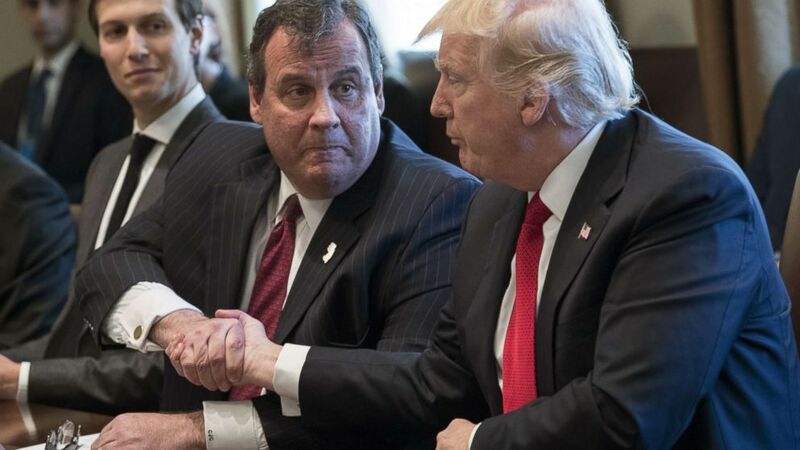 Chris Christie and President Donald Trump attend a panel discussion on opioid and drug abuse in the Roosevelt Room of the White House, March 29, 2017. The former 2016 presidential candidate and ABC News contributor wrote that “one day in May” Trump called him at his office in Trenton, New Jersey, asking if he was willing to be considered as his running mate. “I don’t think he was surprised by my answer,” Christie wrote, adding that he’d been open about his “interest in the job” since the day he and his wife, Mary Pat, showed up to Trump Tower to endorse Trump’s candidacy. “Am I ready? Ready for what?” Christie asked. “You know what,” Trump replied, according to the book. But, influence from the rest of the Trump clan may have been what thwarted Christie’s name from being added to the ballot, and then-Indiana Gov. Mike Pence was chosen instead. An excerpt from “Let Me Finish: Trump, the Kushners, Bannon, New Jersey, and the Power of In-Your-Face Politics.” Reprinted by permission of Hachette Books. All rights reserved. attorney general. Those were the two positions I had my eye on. action in an eleventh-hour attempt to block that. good sign. Somewhere after Baltimore, I spoke to Eric Trump. I’d always felt close to Eric.